our patients. Please stop by with your pet even when you don't have an appointment to get a treat for your canine or feline companion! We always love to see our patients! Since stepping up onto a scale can be scary for dogs and cats, your pet will be weighed on our scale which has been countersunk into the floor. This is one of our spacious wellness examination rooms. There is enough room in here for the largest of dogs. Weight loss consultations and behavior consultations also take place in this room. Our pharmacy area has a complete range of medications just for your pet. The pharmacy also houses one of our computer workstations. All of our medical records are computerized. No paper files to lose or illegible medical records. An In-House Laboratory with state-of-the-art equipment allows us a quick way to get important information about your pet's health. Digital X-Ray is part of our commitment to the most cutting edge diagnostics. This same digital x-ray machine is used in many human hospitals across the country. 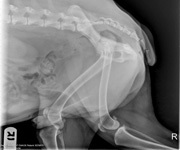 This is a digital x-ray of a cat who has pulmonary edema (fluid in the lungs) secondary to heart failure. On traditional x-ray, this "film" could easily be confused with many other conditions. With digital x-ray the depth of detail you can see in just one exposure leads to a more direct and accurate diagnosis. 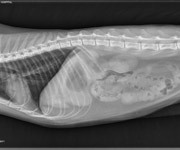 This is a classic x-ray of a linear foreign body in a cat. A linear foreign body is something that a pet eats that it should not have (like a piece of string or dental floss) and it gets stuck in the intestines causing them to bunch up like you see in this digital x-ray. 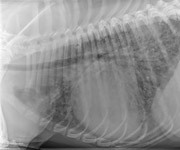 This is a digital x-ray of a side or lateral view of the hips of a large breed dog. Our surgery suite is equipped with modern patient monitoring equipment. Since surgery is performed in an aseptic environment, our surgery suite has a separate air exchange system. We are dedicated to keeping your pet pain-free and nice and warm during surgery. 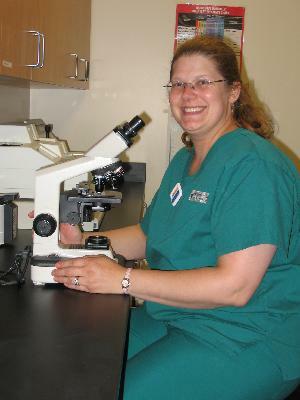 Licensed veterinary nurses monitor patients throughout surgery and recovery. Our ICU(Intensive Care Unit) is located at the heart of the hospital. This allows us to keep a constant eye on critical patients. Isolation Unit - Patients with infectious diseases are hospitalized in a separate ward to prevent spread of disease to other pets. Our staff has been specially trained to prevent cross contamination when working with hospitalized patients. This ward has it's own ventilation system separate from the rest of the hospital. Comfort room - This large, sunlit room has been designed to be a little less like a hospital exam room. It has lights that can dim and some of the comforts of home. We use this room for consultations and for when it's time to say goodbye to our beloved pets.